1st Spring Harvesting Season from end of March to before April 5th Pre-Qing Ming teas are the first teas plucked each new spring season. Depending on the location and altitude in each tea-producing region, leaf plucking can begin as early as the middle week of March and continue until April 5th. Pre-Qing Ming teas command the highest prices because the demand for these teas outpaces the supply each year. This is especially true for the Famous Teas such as Long Ding and Longjing, and the fever for these teas is high in China as well as in the West. It is always better to use a generous amount of leaf and steep that leaf an additional time, yielding 2-3 great cups of tea than it is to use a minimal amount of leaf and have bland, tasteless tea. 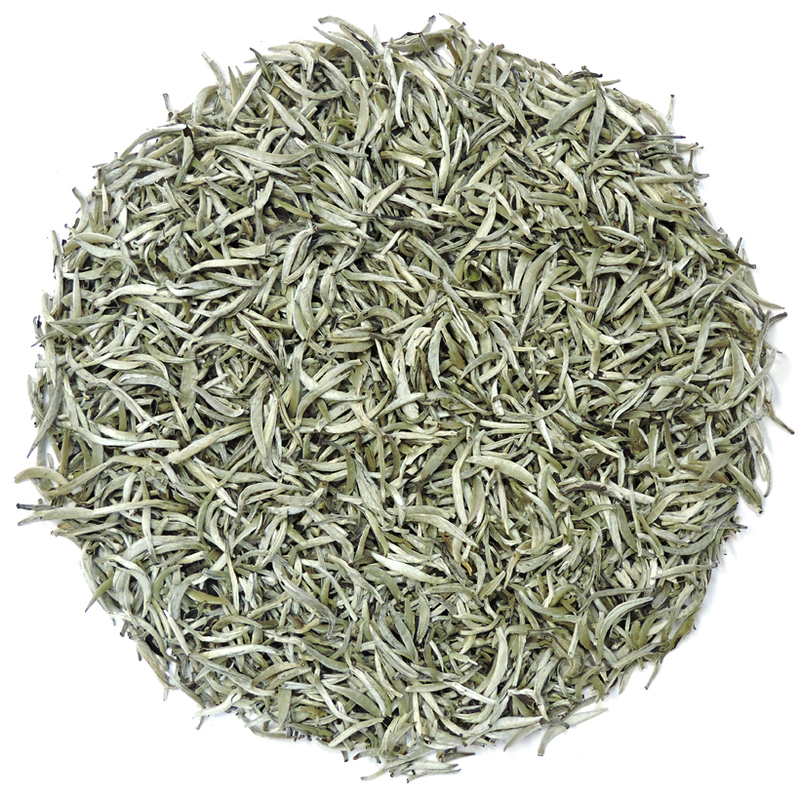 Bai Mudan or White Peony is a modern-style white tea that is comprised of buds and leaf. 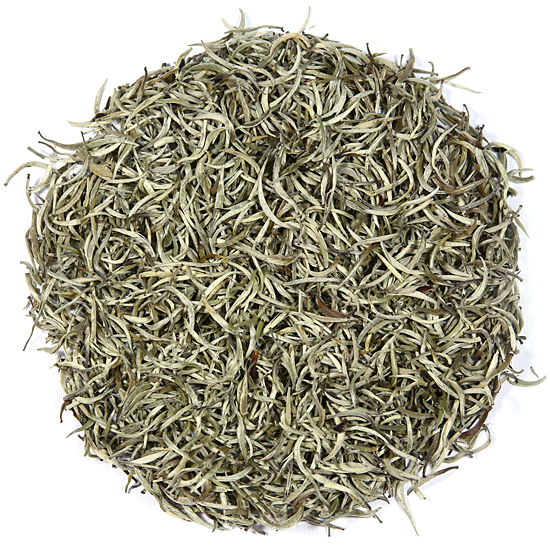 At one time, the only Chinese white tea was Yin Zhen and it was made from a buds-only pluck. Because of the limited availability of these buds and the subsequent high cost of the tea, the need arose for a new version of white tea that could increase the amount produced. In the 20th century, tea makers began to incorporate the leaf from the tea bushes with the buds. Varying percentages of leaf-to-bud are used to make several different modern-style white teas including Bai Mudan. These various modern-style white teas are available in the spring, and show different quality and strengths of flavor. After the tea buds are plucked and Yin Zhen white tea is made, Bai Mudan Traditional-Style white tea is made. Good quality Bai Mudan is a high-grade white tea. Therefore, being plucked from the same bushes as our bud-only white tea, our Bai Mudan is a treat for us to offer. It has a high percentage of buds to fresh, spring-picked leaf. (Some Bai Mudan that we see every year is not really what we think of as Bai Mudan, but a later-made white tea of older leaf that has mostly leaf and few buds). The color of the Bai Mudan in our blend is a lovely soft melange of light greens and white tips with some obvious oxidation – but we avoid Bai Mudan tea that has yellowish or a dull brown leaf. Tea Trekker’s Bai Mudan Traditional-Style is clean and fresh tasting. Many do not realize that the fresh leaf material used to make white tea is not de-enzymed as are all other styles of Chinese tea, and it undergoes slight withering (as does black tea) which oxidizes the leaf and buds just a little. This is one reason why Chinese white teas are so smooth and can be reminiscent in flavor of drinking a very mild black tea. In particular, our Traditional-Style Bai Mudan has a depth of flavor and a heartiness that satisfies and quenches the thirst. In comparison with our Floral-Style Bai Mudan, it has a deeper, fuller flavor and more body. The classic clean and pure taste of white tea is retained by using one of the classic cultivars for it that are traditionally used for Yin Zhen, the true bud-only white tea. When fresh tea leaf is prepared according to the correct manufacture for Bai Mudan, but is made from different cultivars or in a different place, while the style may be correct, the core flavor will be ‘off’. Tea Trekker’s 2018 Bai Mudans are easy steepers and in the cup will be smooth, with a solid aroma. Bai Mudan Traditional-Style has been given sun-drying, a short oxidizing wither and is finally air dried to keep the leaf large and intact and prevent the color from darkening. The leaf is green on one side and silvery grey on the other side, and there is a generous quantity of large and juicy buds. While this may sound like an easy process, making quality white tea requires skill and experience. One doesn’t just pick and dry the fresh leaf, it is much more complicated than that! 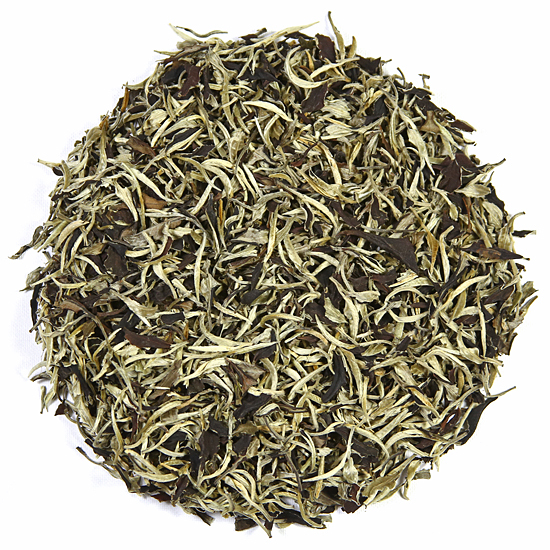 This is a beautiful, hearty and full-flavored modern white tea. And it is a lofty, voluminous tea, requiring the use of a substantial amount of leaf in order to steep a satisfying cup. This tea is delicious hot or cold, but should be steeped in water around 160°F-170°F to prevent scorching the leaf and extracting unwanted astringency. Be certain to re-steep the leaf as with oolong and most green teas. NOTE: We do not pack a 16oz size because the bag would be so huge. If you want 16oz of this tea simply order two 8oz packages or four 4oz – the price is the same and it is much easier to store the smaller volume packages.